New and improved technology is happening so fast, what is new and exciting today is almost outdated tomorrow. Uber came in and shook up the taxi industry, yet they now face stiff competition from at least two other ride share operators. There is no truer saying than, there is only one thing that is guaranteed and that’s change! Robot technology is fast coming to a store near you. We have seen already Amazon Go stores with no serving staff required and the use of actual robots in store to answer customer’s questions. Without doubt, we are not far away from this technology becoming mainstream. What does this mean to the many thousands of staff that serve customers in the traditional stores? Does it mean they will all be out of work, replaced by robots that can speak every language and answer every question? Well yes to a certain degree, however, there is a big need to work hand in hand with robots to offer the customer the best experience. Part of what is driving this change is the quickly growing gap between customer service expectations and reality. A recent US survey found that nearly half of all shoppers felt they knew more about the product they are looking for than the salesperson they dealt with. Put this down to the ease of googling. Furthermore, in research released by Google, two-thirds of shoppers said they were unable to find the information they needed in stores, resulting in almost half leaving feeling frustrated. We have a lot of work to do! Robot technology is well advanced with one example being the Expert Personal Shopper (XPS) from IBM. This bot asks a series of specific related questions that help the customer narrow down what product they are after. This technology dramatically improves the more it gets exposed to customer’s queries. 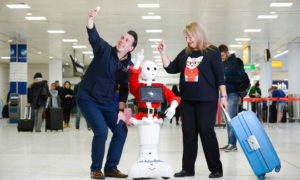 Another bot, from SoftBank Robotics called Pepper, has inbuilt emotional sensitivities that allow it to respond to customer’s commands while being sensitive to the emotional state of the user. Robots tend to have weak fine motor skills, making the manipulation and demonstration of complex objects or tasks very difficult and slow. Therefore, as retail spaces become more experiential in nature, they’ll require human beings to operate and demonstrate products for customers. And artificial intelligence, while tremendous at retrieving factual data and solving linear problems, is not so adept at coming up with creative and sometimes lateral solutions, much less forging an emotional connection with a customer. Technology, on its own, tends not to be the optimal solution. Above all else, what humans bring to the table is their humanity. The retail workers of the future will need to be creative problem solvers who use lateral thinking to assist customers. They will be adept with technology and become ultimate concierges as they expertly guide shoppers and personalise recommendations. The salespeople of the future will be brand ambassadors – enthusiastic super-users of the products that the retailer trades in – who can speak with customers from the first-hand experience. They will be the ultimate personification of the brand. The retail shopping space of the future will marry the efficiency and effectiveness of technology with the expertise, enthusiasm, empathy, and creativity of outstanding human beings. Retail will cease to be the job it has become and reclaim its rightful place as a profession people can be proud to pursue. Thanks to Doug Stephens, retail industry futurist for his insights that I have shared in this article.